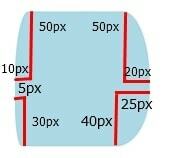 The border radius property converts the rectangular sharp corners of a box into rounded shape corners. The value of border radius may in some unit (px, em) or in percentage (%). There are different perspectives of the border-radius property. We'll take the value in pixels. When we specify a value for the radius property, it is applied to all the four corners of box. If the value of border-radius property is half (50px) of the dimension of the box, then a circular shape is formed. 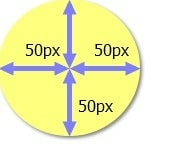 It means that the value of border-top-left, border-top-right, border-bottom-right-radius, border-bottom-left-radius is 50px. It'll be more clear when we define different properties for the four corners. The above individual properties can be combined into one property. The following example forms the same shape as the example given above. In this case, we'll take the value in percentage (%). We can also define border-radius properties for the individual corners. See how border-radius property transforms the corners into rounded shape. The width and height of the box is 100px.